TEHRAN, Iran (AP) — Iran’s nuclear chief said Tuesday he hopes Tehran’s landmark atomic deal with world powers will survive President Donald Trump withdrawing the U.S. from it, warning the Islamic Republic’s program stands ready to build advanced centrifuges and further enrich uranium. In an exclusive interview with The Associated Press, Ali Akbar Salehi stressed Iran would be guided by “prudence and wisdom” when weighing whether to abandon the deal if European nations fail to protect it from Trump. The U.S. withdrawal from the deal already has badly shaken Iran’s anemic economy, crashing its currency, the rial. That likely will be compounded by U.S. sanctions coming in November that threaten Iran’s oil exports, a major source of government funding. All this puts further pressure on the administration of Iran’s relatively moderate President Hassan Rouhani, to whom Salehi reports as one of his vice presidents. But Salehi dismissed out of hand the idea of caving to American demands to renegotiate the accord. “Yes, we have our problems. Yes, the sanctions have caused some problems for us. But if a nation decides to enjoy political independence, it will have to pay the price,” Salehi said. “If Iran decides today to go back to what it was before, the lackey of the United States, the situation would” be different. Salehi heads the Atomic Energy Organization of Iran, whose Tehran campus encompasses a nuclear research reactor given to the country by the U.S. in 1967 under the rule of the shah. But in the time since that American “Atoms for Peace” donation, Iran was convulsed by its 1979 Islamic Revolution and the subsequent takeover and hostage crisis at the U.S. Embassy in Tehran. For decades since, Western nations have been concerned about Iran’s nuclear program, accusing Tehran of seeking atomic weapons. Iran long has said its program is for peaceful purposes, but it faced years of crippling sanctions. The 2015 nuclear deal Iran struck with world powers, including the U.S. under President Barack Obama, was aimed at relieving those fears. Under it, Iran agreed to store its excess centrifuges at its underground Natanz enrichment facility under constant surveillance by the U.N. nuclear watchdog, the International Atomic Energy Agency. Iran can use 5,060 older-model IR-1 centrifuges at Natanz, but only to enrich uranium up to 3.67 percent. That low-level enrichment means the uranium can be used to fuel a civilian reactor but is far below the 90 percent needed to produce a weapon. Iran also can possess no more than 300 kilograms (660 pounds) of that uranium. That’s compared to the 10,000 kilograms (22,046 pounds) of higher-enriched uranium it once had. 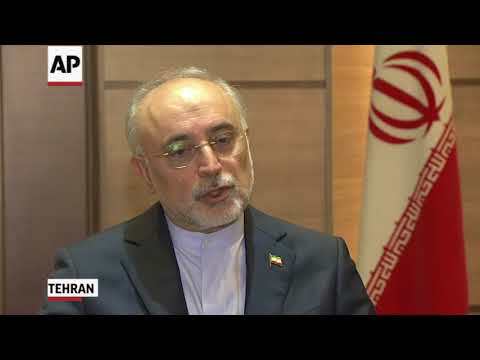 Salehi spoke to the AP on Tuesday about Iran’s efforts to build a new facility at Natanz that will produce more-advanced centrifuges, which enrich uranium by rapidly spinning uranium hexafluoride gas. The new facility will allow Iran to build versions called the IR-2M, IR-4 and IR-6. The IR-2M and the IR-4 can enrich uranium five times faster than an IR-1, while the IR-6 can do it 10 times faster, Salehi said. Western experts have suggested these centrifuges produce three to five times more enriched uranium in a year than the IR-1s. While building the facility doesn’t violate the nuclear deal, mass production of advanced centrifuges would. Salehi, however, said that wasn’t immediately a plan. Salehi suggested that if the nuclear deal fell apart, Iran would react in stages. He suggested one step may be uranium enrichment going to “20 percent because this is our need.” He also suggested Iran could increase its stockpile of enriched uranium. Any withdrawal ultimately would be approved by Iran’s Supreme Leader Ayatollah Ali Khamenei. While the U.N. repeatedly has verified Iran’s compliance with the deal, Trump campaigned on a promise to tear it up. In May, he withdrew the U.S. in part because he said the deal wasn’t permanent and didn’t address Iran’s ballistic missile program and its influence across the wider Middle East. But Trump meanwhile has tweeted he’d accept talks without preconditions with Tehran. In the wake of Trump’s decision, however, Western companies from airplane manufacturers to oil firms have pulled out of Iran. The rial, which traded before the decision at 62,000 to $1, now stands at 142,000 to $1. Despite that, Salehi said Iran could withstand that economic pressure, as well as restart uranium enrichment with far more sophisticated equipment. Still, danger could loom for the program. The Stuxnet computer virus, widely believed to be a joint U.S.-Israeli creation, once disrupted thousands of Iranian centrifuges. A string of bombings, blamed on Israel, targeted a number of scientists beginning in 2010 at the height of Western concerns over Iran’s program. Israel never claimed responsibility for the attacks, though Israeli officials have boasted in the past about the reach of the country’s intelligence services. “I hope that they will not commit a similar mistake again because the consequences would be, I think, harsh,” Salehi warned. This version corrects the amount of higher-enriched uranium that Iran once had to 10,000 kilograms (22,046 pounds), not 100,000 kilograms (220,460 pounds).